Drinking up to four cups of caffeinated coffee a day is perfectly healthy, but decaffeinated coffee has many benefits. It lets coffee drinkers have a late cuppa without staring at the ceiling into the wee small hours. It is also a good bet for pregnant or breastfeeding women and people with medical conditions like insomnia or high blood pressure. The process used to decaffeinate coffee also lowers beans acidity meaning that people who find the regular stuff upsets their stomach often fare much better on decaf. But decaffeinated coffee has an image problem. The very word ‘decaf’ is associated with flat, tasteless cups of mirky brew. Decaf’s inferiority is largely a myth that has its roots in history. Thanks to technological breakthroughs modern caffeine-free coffees can more than satisfy the sophisticated pallets of the even the most discerning drinkers. Below is a list of our favourite decaf varieties on the market today. For the curious, there brief description of the different ways the decaffeinated process works and how it has changed over the years can be found at the bottom of this article (or you can click here to jump straight to it). Decadent Decaf is an outfit on a mission to change the much-maligned reputation of decaf coffee and are committed to churning out very high-quality stuff. This single origin Indonesia Sumatra is no exception. The beans are sourced from the Mandheling Province of West Sumatra and have notes of brown sugar and cocoa. It’s a well-rounded cuppa and only a pro coffee taster would be able to tell the difference between this and a normal coffee. 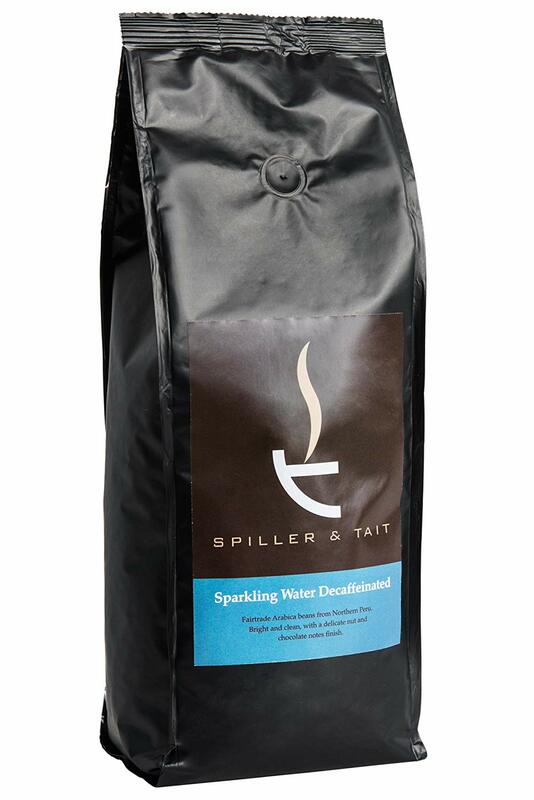 The beans were decaffeinated using the all-natural Swiss Water method outlined below too – no nasty chemicals here. It is available through Amazon, or direct through the Decadent website (where it is actually a bit cheaper at the time of writing) so good buying options too. 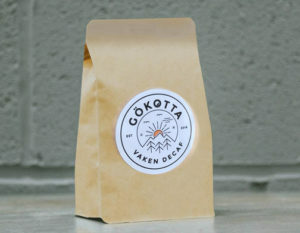 We were already fans of Liverpool based Gökotta, so we were quite happy to see them launch a decaf. A blend of three Colombian beans go into this Vaken decaf (Vaken is Swedish for awake in case you were wondering – a slightly ironic name for a decaffeinated coffee!) and the result is a very tasty decaf indeed that works really well either as a espresso or brewed with a cafetiere or other filter. The company claim that you will struggle to tell the difference between this and a regular coffee, and while we wouldn’t go quite that far – it is still very good! These beans have had the caffeine knocked out of them using the natural C02 method explained below. 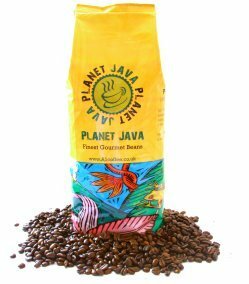 They are a blend of high-quality Arabica beans from northern Peru which are certified as fair trade. They are roasted medium-dark and produce a cup with nutty, chocolatey notes that are very polished for a decaf. The blend is a versatile one and depending on how ground can be brewed up in a variety of styles including espresso, French press and pour over. Great beans here, all sourced from hillsides in Colombia’s coffee-belt. The beans have been decaffeinated naturally using the C02 process. The coffee is very versatile and is medium roasted with a nice mellow flavour. Perhaps less impressive for those who like an espresso – but great for people who like the longer-style filter coffees and pour overs. 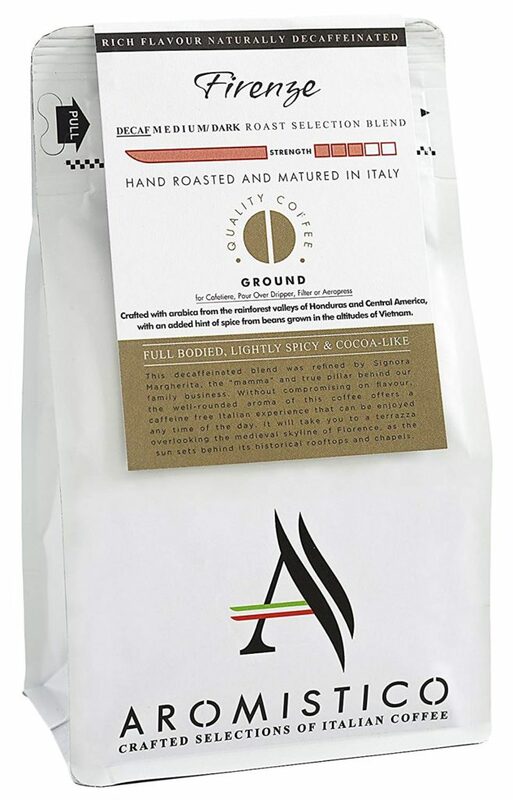 Produced by a family run Italian company, these chemical-free decaf beans are hand roasted on the shores of Lake Garda. The coffee is a blend of beans from Central America and that have a full-bodied cocoa-esque flavour as well as beans from Vietnam which give it an almost spicy kick. 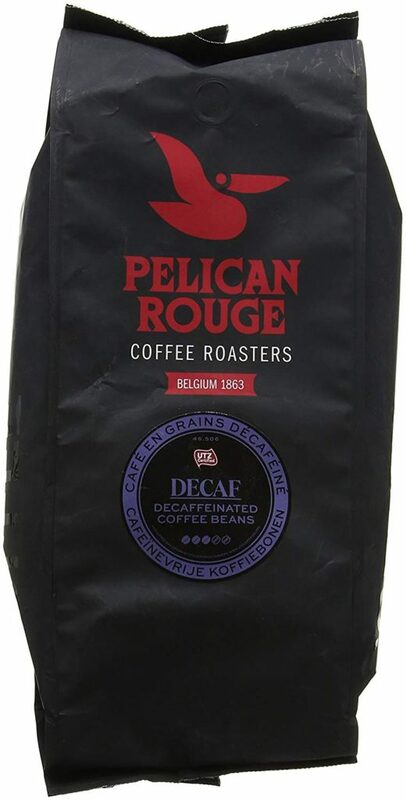 This blend from Belgian outfit Pelican rouge is a versatile roast that will stand up when brewed in a variety of ways. The blend – like many others that are geared towards making a decent espresso, features a small quantity of robusta variety beans which helps it produce a thick crema. It’s a dark roast with a fairly sweet flavour, impressively full-bodied for a decaf. Caffeine-free coffee has come a long way since its early days. The process of removing the magic molecule from beans was invented by German merchant Ludwig Roselius who commercialized the product under the still successful ‘cafe HAG’ brand. Early attempts at removing caffeine relied on treating the beans with solvents such as benzene. This damaged the beans and affected the quality of the coffee, making it harder to roast accurately. Chemical solvents including ethyl acetate or methylene chloride are still used today, but a new breed of demanding coffee customer has helped drive the push towards chemical-free methods of production. Today’s more natural methods are gentler and do a much better job of preserving the flavour of coffee beans. The two most popular ‘natural’ ways of doing it are called the ‘Swiss Water Process’ and the ‘C02 Process’ (both are explained below). When choosing a decaf, look for these as chemical methods affect compounds key for the flavours and aromas of the magic bean to a much greater degree. This involves soaking raw beans in caffeine-free green coffee extract as a solvent. As the beans steep, their caffeine is drawn out into the liquid. The coffee is drained out and the beans are dried and bagged. While a natural and gentle process, the same solvent is often used to treat a vast number of batches of beans, which some say flattens out the unique flavour and aromas of any individual bean. This involves soaking raw beans in water and in a sealed tank and pumping C02 into the beans at very high pressures. This draws out the caffeine but leaves larger molecules responsible for taste behind. Neither method is perfect. Chemical and flavour profiles of beans are almost always affected in some way by the treatment process. However, the industry is light years ahead of where it was 30 years ago and it is possible to get some very delicious decaf coffees that are worth every penny.